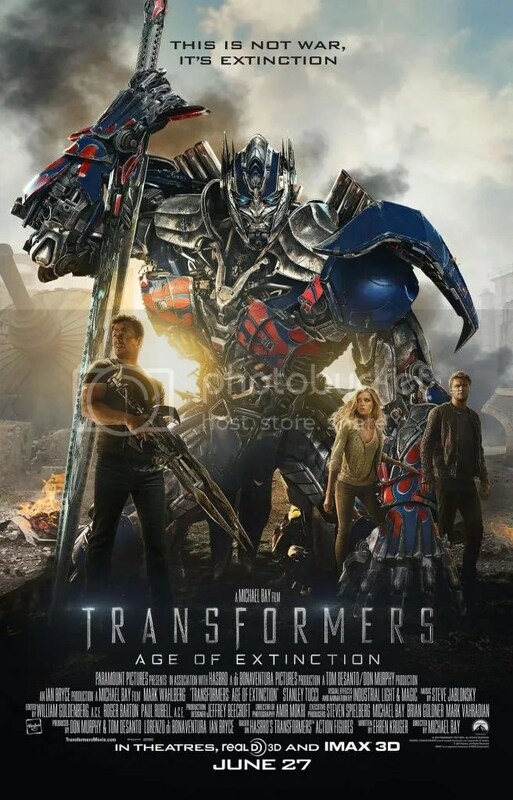 Transformers: Age of Extinction is a critic proof movie. We get one once every 18 months or so, a film that is loudly reviled by basically everybody and yet still rakes in vast amounts of money. It’s a virtuous circle of snark; critics get to rail against the unstoppable juggernaut, the juggernaut gets to rampage across the Box Office for a few weeks, the trademarks get serviced and most people get paid. It’s not a good system, or even a practical one, but it’s the one we have and blockbusters like Age of Extinction show off every single one of its flaws. I saw it last week. It’s mostly awful. But that, weirdly, is also a good thing. I’m not going to bore with you details, or many spoilers, because everyone and their dog will have done that by now. The short version is; several years after the catastrophic events of the last movie, a CIA kill team are working with a Cybertronian bounty hunter to bring in every transformer on Earth. A badly wounded Optimus Prime is discovered by Cade Yeager, failed inventor, tenant and pretty much father. He repairs Prime and goes on the run from Lockdown, the bounty hunter, with his daughter, her boyfriend and his new truck buddy. Shouting happens as do many, many explosions and, eventually, China. Prime is at the centre of both the movie and every single one of its problems. The original character was essentially Jack Ryan crossed with a pacifist monk; a leader whose tremendous capacity for violence was balanced by his total revulsion at its necessity. Prime’s motto, on the toy I owned, was ‘Freedom is the right of all sentient beings’. He was an academic who was forced to pick up a rifle, Richard Winters with a vehicle mode. A reluctant hero and an even more reluctant leader, he was, and remains, a character who brings out every single tic of whoever is writing him. When that works, he’s a figure of tremendous humility and moral authority. When it doesn’t, he’s Dudley Do Right or, as we see here, a barely functional psychopath. 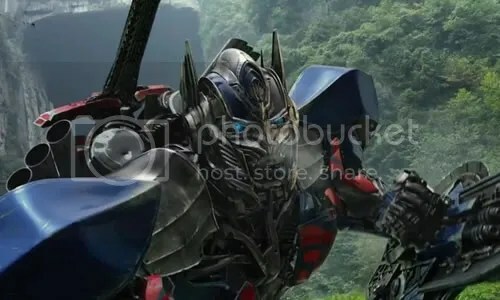 Prime’s second line in the movie is ‘I’LL KILL YOU!’. When he’s healed enough to choose a new, top of the line (And available now from all good dealerships no doubt) vehicle mode, he gains a GOT AMMO? Bumper sticker. When he sees footage of old friend Ratchet being melted for scrap he vows to find the human responsible and kill him. Freedom is the right of all sentient beings. Except, apparently, for Kelsey Grammer. This change in character has been flirted with since the second movie but here it’s overt. Prime is a perpetually angry, brutally violent soldier with absolutely none of the moral compunctions that used to define him. Ridiculously, he’s given a knightly back story too in the same movie that sees him content to abandon the Dinobots to life in a prison ship until they’re useful and engaging human soldiers in man to truck combat. He’s still the leader of the Autobots, still prone to endless speeches and still dies a lot but any pretence of the character from any of the comics being present has gone. Hell, he’s barely the character from the original Bay-directed movie at this point. He is a character though. Just. The Dinobots are far less lucky. Again, there’s a huge, rich history to the Dinobots and again it’s completely ignored. There are countless versions of them that have explored the dysfunctional personalities of the group, the horrors of scientists and civilians being pressed into military service and most pertinently, the pack dynamics of their personalities. The Dinobots are arguably the most varied, most interesting set of characters the franchise has created and Grimlock in particular is a ridiculously popular, nuanced individual. Here, they have one line, no names, turn up in the final 45 minutes of the film and then leave. They may as well be large white TRADEMARK signs rampaging across China for all the personality they exhibit. It’s a disastrous approach to a set of characters like this, perfectly embodying every single criticism so often levelled at Bay and his work. It’s empty, meaningless spectacle which, coupled with Ehren Kruger’s fondness for callous brutality instead of character development leaves a thoroughly nasty aftertaste for most people. I watched the movie a few days ago. When the lights went up, there was a 10 year old boy behind me applauding wildly and his reaction is what I can’t stop thinking about. His response was completely pure; total, abject enjoyment. He didn’t see the bloated running time, the minimal yet somehow still screen hogging characters or the fact that the Autobots are essentially a group of sociopaths . Instead, he saw a film filled with action and spectacle and huge, glorious impossible things that swept him up and carried him to the end on a tidal wave of pure, probably constantly exploding, adrenalin. I’ve been that kid. There are plenty of films where I still am that kid. It’s an amazing feeling, what my Dad used to call a ‘silly grin’ movie, to be relentlessly entertained like that. All you want to do is dive into the world of the movie, relive it, pull it apart, understand it and, maybe, write about it. He’s all of us when faced with culture we love; enraptured, grateful, grinning from ear to ear. Have fun in there, kid and if, in twenty years, you do end up writing these things yourself, do me a favour? Give the Dinobots some lines? Trust me, it’ll pay off.